I hate being stuck. 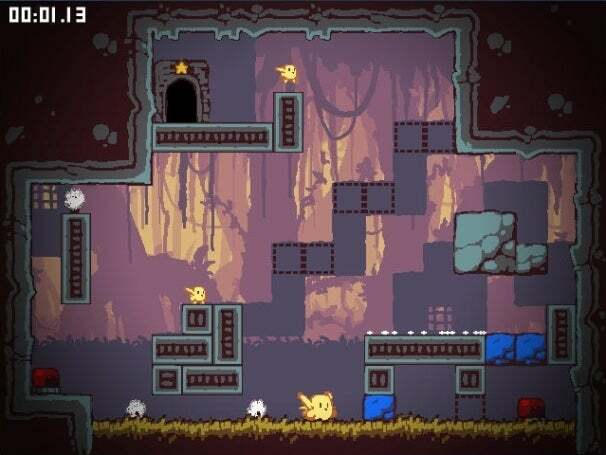 It’s why I generally avoid platform puzzlers; for the first dozen or so levels I feel like some kind of savant, gliding past button- and hazard-oriented quandaries with ease. And then I hit the wall. Level 25 of Offspring Fling was that wall. First, the game: Offspring Fling is the brainchild of Kyle Pulver. As his website so eloquently states, he makes games. They’re all rather pleasing, aesthetically – he seems fond of platformers. In Offspring Fling, a forest critter loses track of her progeny, and needs to rescue them by picking them up and hurling them through the air; if you’ve got a more efficient way to transport children, I’d love to hear it. The wall, though. Level 25 isn’t even much of a challenge, which is the infuriating part. The button on the left phases the blocks in the lower right corner in and out of existence. That button locked away on the right controls the steps to get up. The top completion time for this level is something like 20 seconds. As the minutes rolled by and saw me repeatedly hurling my infant into walls, I found myself questioning, well, everything: my reflexes, my analytical ability, my intelligence. This is why I avoid puzzles. And then I went to bed, woke up this morning, and burned through the level in about 25 seconds; cue the unbridled rage. This is the sort of game that makes a bit more sense with moving pictures, so here are some moving pictures. There are “over a hundred levels” in the final build, and the game will be released on PC and Mac. The preview build I checked out ran on Windows, but it installed Adobe Air, which leads me to believe the game could run anywhere that does (including Linux). Kyle Pulver says the game should be out Mid-March, so… any day now. Offspring Fling is a little rough around the edges at the moment, and gamepad support is cobbled in with JoyToKey, keyboard emulation software for joysticks. But it’s well beyond the stage of something-I-would-pay-for, so I’m looking forward to throwing money in Kyle’s general direction.